On the strength of this week's run of Eugene Onegin, presented by the Bolshoi Opera, I conclude – although perhaps with the risk of sounding slightly chauvinistic – that Russian operas are surely best performed by Russians. Of course, I do not know if the particular performance which I witnessed was better or worse than the rest of this current London run or, indeed, other performances given by the Bolshoi. But I do know that their passionate delivery, including some deliberate (and, in my view, appropriate) orchestral harshness at times, seemed timelessly authentic and convincing from every point of view. I did not feel that I was watching the Bolshoi in the Royal Opera House; I felt as if I was in the Russian countryside (which is where the plot of the opera evolves) peopled by Russians. However, I am not convinced about the hallmark of the production. One can wonder whether the title of the opera is entirely accurate or whether the piece should have been titled as Tatyana? Surely the plot is more about Tatyana's progression from a naïve, idealistic and passionate young girl to a still passionate but disciplined, loyal and mature woman. Arguably Onegin, the outsider in this rural Russian scenario, is the cause for Tatiana's passion and for Lensky's unintentional death; Onegin's outsider status must have prompted the title for Pushkin's verse novel and Tchaikovsky's opera (that is, Lyrical Scenes in Three Acts). Unfortunately, in Dmitri Tcherniakov's staging neither Onegin nor Tatyana is the focal point, but a table which takes up centre stage throughout the whole opera. Thus this production could justifiably be titled The Table. 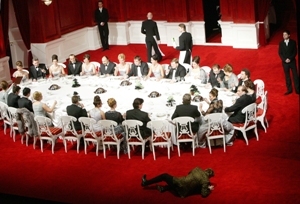 Presumably the rationale behind making the table the main character was to show that outsider Onegin and passionate Tatyana had to function in traditional communities, whose ordered life centred on the family table. But the static table – what else can a table be? – made for an evidently deliberately static production. I do not know whether Tcherniakov used this device to underline Tatyana's frustration with how life in her environment was set. But, without doubt, Tcherniakov ignored Tchaikovsky's intention of giving a more comprehensive picture of Russian country life. To almost entirely ignore Tchaikovsky's dance music is a travesty. The worst example of this was the opening grand Polonaise, that is the ball scene, of Act III. The rousing music, played in a truly rousing manner by the orchestra, was practically betrayed by having a group of people just sitting around The Table. We had a ball scene without a ball! Discrepancies between libretto and staging were numerous but not always detrimental. I liked the allocation of Monsieur Triquet's song to Lensky: it made dramatic sense and it was beautifully rendered by Alexei Dolgov, whose nuanced characterisation – dramatically as well as vocally – was exemplary. But it seemed odd to have Tatyana deliver her great letter scene (specifically set by the authors in her bedroom) in the communal dining room. It made a nonsense of the nurse entering in the morning with the intention of waking Tatyana. The almost non-stop communal eating around the table was also at odds with such announcements as 'it is time for supper' (closing scene of first tableau, Act I). On the other hand, Tcherniakov's attention to detailed characterisation of individuals was exemplary. The famous letter scene was most moving in every sense of the word. Tatyana's body language fully supported the words and action. Details of body language were also astute in the portrayal of all the other characters in the plot, thus Tcherniakov's insight did indeed make the opera, as intended, into a succession of lyrical scenes. However, it seems a shame that Tcherniakov ignored musical matters (on the top of ignoring the dance elements in Tchaikovsky's masterly dance numbers). For instance, the opening duet (Tatyana, Olga) was more disturbed by staged family dramatics than made musical sense in the opera house (even though, admittedly, the duet was supposed to be sung outside the house). The singers, as well as the chorus, were excellent. Apart from the above mentioned Alexei Dolgov, special credit goes first to Tatyana Monogarova who looked, sang and acted the part of Tatyana as if she was the real Tatyana of the plot. The Polish Mariusz Kwiecien (Onegin) sounded and looked seductive while, appropriately, also as the odd one out. (To my British-Hungarian ears, Kwiecien's possibly Polish Russian did not jar with the rest of the entirely Russian cast). I am uncertain whether it was on purpose or not, but vocally the Gremin of Anatoly Kotscherga sounded old. 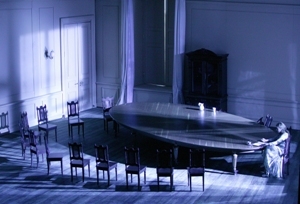 If you like tables, the set design was attractive; the lighting was varied (always in tune with action and/or music) and almost magical. The costumes were tasteful, beautiful and meaningful. In the first two acts, all wore a light colour except for Onegin, who wore black; in the third act, all the men wore black tie except for Onegin who wore a shiny silvery jacket. I appreciated the earthy but sensitive approach of conductor Dmitri Jurowski and the Bolshoi orchestra. The dramatic outbursts of the brass in Tatyana's letter scene and later at Lensky's frustration about Onegin's flirting with Olga were powerfully dramatic. At the other end of the scale, Tatyana's and Onegin's duet at the conclusion of the opera were most lyrically (as well as passionately) shaped by Jurowski. The table was a bit much for me, but otherwise I thoroughly enjoyed this authentic musical trip to Russia.